MOSCOW – The World Jewish Congress co-organized this week the Second Moscow International Conference on Combating Antisemitism, Xenophobia, and Racism, under the leadership of the Russian Jewish Congress, with 600 delegates from more than 35 countries, including government representatives and law enforcement officials, as well as international experts in the field. World Jewish Congress President Ronald S. Lauder had been scheduled to speak at the conference but canceled his visit to Moscow in order to travel to Pittsburgh to stand in solidarity with the community in the wake of the deadly shooting at the Tree of Life Synagogue. The WJC delegation was headed by WJC Commissioner for Combating Antisemitism Julius Meinl and CEO and Executive Vice President Robert Singer, as well as 47 members of the WJC Jewish Diplomatic Corps from nearly 40 countries, alongside the Russian Jewish Congress and its president, Yury Kanner. “There is only one short step from appeals inciting interethnic and sectarian strife to murder and pogroms. A shattering example of this is the horrible Pittsburgh shooting," reads the declaration. The task of the co-signatories now is to draw public attention, stimulate changes in legislation, and support cultural and educational projects and civil initiatives aimed at countering antisemitism, racism, and xenophobia. At the conference, the RJC released a study, conducted with the support of the WJC and the EuroAsian Jewish Congress. Among the key findings was that 8-15 percent of Russians harbor xenophobic tendencies, a decline since 2013. The study also found that xenophobia in Russia tends to target “ethnically different” groups rather than Jews, who are still considered by Russians to be “one of us.” The main targets today are natives of the Caucasus, Central Asia, and black people. The study also found that antisemitism and xenophobia were promoted by those adhering to a neo-Nazi ideology, and that Russian antisemitism has no anti-Zionist component, unlike in the European countries, where the antisemitism is closely related to Israeli policies. WJC CEO and Executive Vice President Robert Singer addressing the conference on 29 October 2018. (c) World Jewish Congress. Representatives of the Russian government and law enforcement agencies, as well as leading domestic and foreign experts, comprised the high-level participation and speakers, including Advisor to the President of the Russian Federation, Mikhail Fedotov, Chairwoman of the Federation Council Valentina Matviyenko, Chairman of the Moscow City Duma Alexy Shaposhnikov, Chief Rabbi of Russia Berl Lazar, Secretary of the Vatican Commission for religious relations with the Jews Fr. Norbert Hofmann, Mufti of the Spiritual Assembly of Muslims of Russia Albir Kgranov, and former UNESCO Director General Irina Bokova, among others. 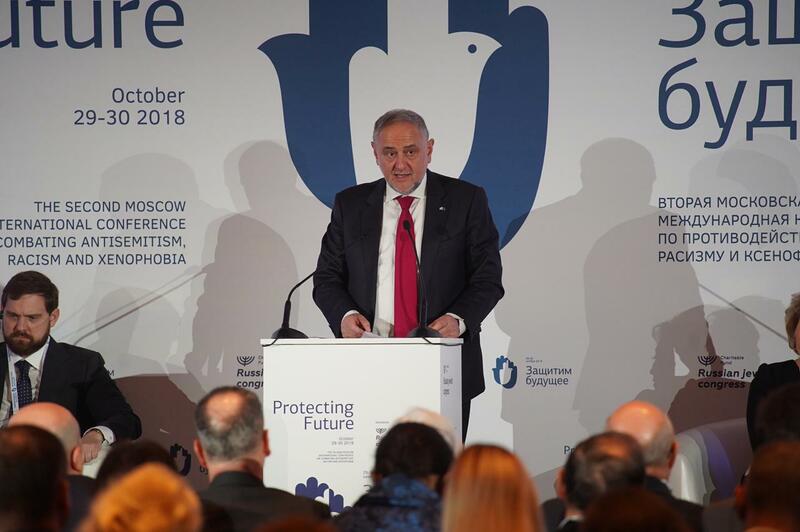 The conference was organized in partnership with the Russian Jewish Congress, the World Jewish Congress, Genesis Philanthropy Group and Euro-Asian Jewish Congress, with official supported by MFA of Russia, Moscow Government and Federal Agency for Nationality Affairs of Russia. This event is a partnership initiative of the World Jewish Congress and Genesis Philanthropy Group.